Int 94il Freshman seminar homepage, Prof. Marcuse, UCSB History Dept. Jan. 13, 2014: posting my W'2014 94qw syllabus: "The Environmental Movement in Germany"
May 29, 2008: Yesterday I completely forgot that I wanted to announce that a very unique Holocaust survivor will be speaking in one of my other classes in Campbell Hall today (Thursday, 5/29), at 12:30. I wasn't able to find a survivor who could speak to our seminar, and this presenter wanted to speak to the larger audience. There was only one uprising in a concentration camp that led to a mass escape and the closure of a camp: the one in the Sobibor extermination center in eastern Poland on October 14, 1943. About 700 prisoners were forced to run the machinery of murder in the camp; of several hundred who escaped that day, about 100 were able to escape the dragnet and Polish vigilantes and survive until the end of the war in May 1945. In 1944 the Nazis dug up the mass graves, burned the corpses that had been buried, demolished the camp buildings, plowed the site over and planted trees there. The Wikipedia page about the Sobibor camp. Even if you can only come for part of it (enter/exit through the doors on the far sides), I think it will be worth your while to sit in. May 4, 2008: This is a reminder that we've rescheduled the 1940 Chaplin film *The Great Dictator* from this Monday to two weeks later: It will be on Monday, May 19, at 6:30pm in HSSB 4041 (same room as last time). Last week we finally got some discussion going. For this Wednesday, please think up some questions you're interested in talking about. 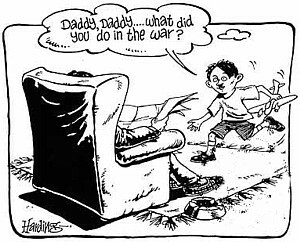 April 14, 2008: The books hadn't arrived as of this morning, so I've scanned the reading for this week as well: Chaps 8-15 as pdf [4/16: 2 page spreads missing, also notes]. I'll let you know as soon as they arrive. *Please think of questions while you're reading--we have the whole hour to spend discussing this material. * You might also want to peruse some of Mein Kampf--the unexpurgated English translation is available as an ebook at gutenberg.net. April 10, 2008 (Thursday): note that tonight at 7:30pm in Campbell there will be a free screening of the film Conspiracy, about the meeting in 1942 at which top Nazi gov't officials coordinated the Holocaust. The director will introduce the film, and there will be a dialog with Prof. Marcuse and others afterwards. See event page for more details. April 6, 2008: Reading for Wed. 4/2 as pdf; 2008 syllabus. On Jan. 7 a new comedy film by Dany Levi was released in Germany, Mein Führer. 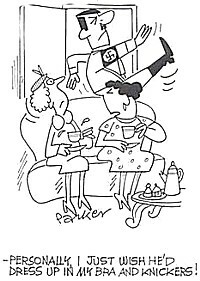 Listen to this Jan. 13, 2007 NPR report, " Hitler Comedy No Laughing Matter for Germans"
What do Hitler and Nazism stand for today? When are they mentioned, and why? After investigating these questions, this seminar will look back to see how Hitler and Nazism were portrayed in the US media since the mid-1920s. We will examine newspaper reports, books and films from the entire 80-year period. 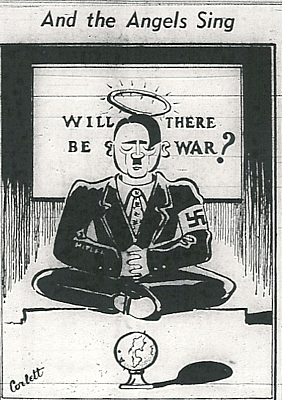 "U.S. Student Perceptions of Adolf Hitler, 1933-1939," a UCSB history senior honors thesis by Melissa Kravetz, 2004. It is based on reports in the student newspapers of UC Berkeley, UCLA, Harvard and Yale. 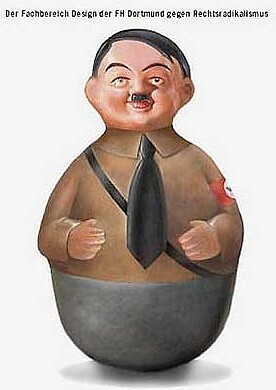 "The Munich Post: Its Undiscovered Effects on Hitler," a UCSB proseminar paper by Sara Twogood, 2002. Freshman seminars (UCSB freshman seminar program website) give students an opportunity to get acquainted with a professor and the professor's research in a small group setting. I teach German history, and my particular specialty is the different ways Germans have reacted to and thought about the Nazi period since the end of World War II. This includes how the Nazism is currently taught in German and US schools. My goals for this course are to learn more about what you have learned and what how you about Hitler and German history. I am writing a book about what people today think about Nazism and the Holocaust. I hope to learn about your experiences and interests, but also from your research projects for this course. As for your goals, I am very eager to hear about them! If you haven't done so already, please give it some thought and let me know! 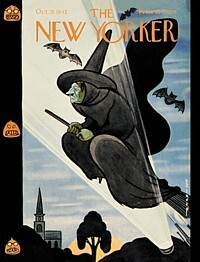 His best friend in Vienna, August Kubizek, published a series of articles in The New Republic, April 5, 12, 19, 1939, pp. 239-42, 270-72, 297-300. Journals in the library database JSTOR. Hitler's 12 apostles, by Oswald Dutch. Description 271 p. pl., ports. 22 cm. Notes "First published November 1939. 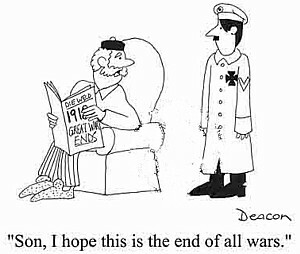 Reprinted March 1940." Contents The frame. -- Herrmann Goering. -- Dr. Josef Goebbels. --Alfred Rosenberg. -- Rudolf Hess. -- Heinrich Himmler. -- Dr. Robert Ley. -- Joachim von Ribbentrop. 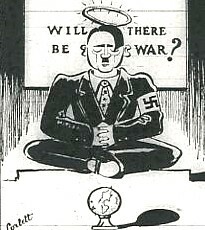 -- Julius Streicher. -- General Walther von Brauchitsch. -- Dr. Walther Funk. -- Dr. Wilhelm Frick. -- Baldur von Schirach. -- The martyrs. -- The "would be" apostles. -- Twelve faces and a world philosophy. -- Chronological summary of the National socialist movement. 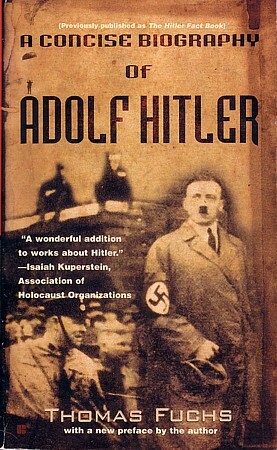 The Hitler filmography : worldwide feature film and television miniseries portrayals, 1940 through 2000 / by Charles P. Mitchell. Published Jefferson, NC : McFarland & Co., 2002. Description ix, 293 p. : ill. ; 27 cm. of articles such as this one on the "8 burials of Adolf Hitler"
The German Historical Museum (DHM) in Berlin has lots of images and documents in its collection. Nazi propaganda documents, at an excellent site created in 1999 by Randall Bytwerk at Calvin College in Grand Rapids, Michigan. The US Embassy in Germany has a "History of German-American Relations" site with great documents from 1683 to the present, easily navigable with great e-texts and links. The US State Department publishes documents from the Foreign Relations of the United States (FRUS), which include Germany (see the Europe volumes under FDR; list of print volumes). June 5, 2005: I'm just starting this website as I draft the syllabus, so NOTHING is FINAL yet. Meeting time & Location: Thursdays 2-3, HSSB 4041. This seminar will be coordinated somewhat with my Hist 33d lecture course on the Holocaust (esp. the trip to Los Angeles and the evening film screenings). For maximum learning, you may consider enrolling in that course as well (T-Th 9:30-11, W 6-9pm). Since it is already full, you will need to contact me and I will place you on the waiting list. Each week we will have short readings and small "research project" homework. I am planning to pool all of this work on a "Hitler reception" website. For more details on this, see the "research topics" section, below. July 7, 2005: See the UCSB freshman seminar announcement of this course. The field trip to LA (Museum of Tolerance and LA Museum of the Holocaust) will be on Sunday, Oct. 16, 2005. Sept. 8, 2005: One product of this seminar will be a "Hitler in History" website that will include primary sources and their interpretations. I've started making the homepage already. 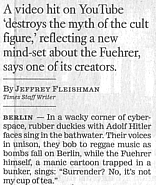 Dec. 21 , 2006: See also my "Hitler in History" website, whichl includes primary sources and a bibliography of books about Hitler. Dec. 22, 2006: The Spring 2007 seminar will meet Tuesdays, 1:00- 1:50pm, HSSB 3201. The enrollment code is 50237.
Who was Adolf Hitler, and why do we see him the ways that we do? Was he a madman, a genius? Can we picture him as a "normal" person? Was he part Jewish? Homosexual? And in any case, does any of this matter? We will investigate these questions and look back in films and texts to see how Hitler has been portrayed since the mid-1920s. Feb. 4, 2007: The Spring 2007 seminar will meet Tuesdays, 1-1:50, in HSSB 3201. Apr. 8, 2007: Those students who e-mailed me have received codes. We are very full at 24 students, but we'll make it work. The 2007 syllabus is now available online. May 23, 2007: On June 5 Prof. Ursula Mahlendorf will speak to our class about her memoir about growing up in Hitler's Germany. Be sure to read at least Chap. 4 about her time in the Hitler Youth, 1940-42, and Chap. 8, about the end of the war, in which she describes how she learned about Hitler's death/suicide, and how it affected her. Please start reading these this week, so we can begin discussion on May 29 and formulate questions we want to ask her. Jan. 24, 2008: The UCSB Int94il website is now available, as is the list of all Spr08 freshman seminars. The course will meet Wed., 2-3pm. I am hoping to get a room that will allow us internet access, but for now the class meets in HSSB 2201. See the 2007 Int94il syllabus for an idea of what we will do. Feb. 15, 2008: I've asked that the enrollment be closed on GOLD, and I've started a waiting list, which now has two names on it. If you would like to be added, please send me an e-mail. One of you noticed that the book wasn't available at the campus bookstore. I just checked, and indeed the staff member never placed my order. You can get a used copy on amazon for pretty cheap (even after postage), and/or we can place a group order on Wednesday, so shipping prices won't play a role. I'll try to scan the first chapters and have a pdf available soon. Analysis: x students enrolled in the course. Thus each student checked this site about every xth day early in the course, about every xth day mid-way through, and every xth day at the end.